Glass Nickel’s ‘Cardiac Arrest’ is a 16-inch beast holding a pound of cheese and loads of meat (pepperoni, crumbled bacon, Boar’s Head ham and sausage). Brian Glassel with a slice of his Cardiac Arrest pizza in Madison, Wis.
Jesus Gutierrez, a pizzaiolo at Cafe Porta Alba located near Hilldale, readies a pizza into a wood fired oven. (Published caption 11/29/09) a pizzaiolo at the new Cafe Porta Alba at Hilldale Shopping Center, uses a peel to put a pizza into the wood-fired oven. The oven, made it Italy, is the centerpiece of the kitchen. It cost $12,000, heats to 900 degrees in 20 minutes and bakes pizza in 90 seconds. A bounty of pizzas await the lunch crowd at Ian's Pizza on Frances Street. The Mac n' Cheese is the most popular. Vincenzo Pugliese, owner of the Cafe Porta Alba, shows off their Neapolitan pizza which features three sprigs of fresh basil, "for aroma." (Published caption 7/20/07) Vincenzo Pugliese, who is from Naples, makes pizza in an authentic Neapolitan manner at Cafe Porta Alba, 15 N. Butler St., and now he has the certification to prove it. Roman Candle's Pestoral features pesto, roasted red peppers, kalamata olives, feta, tomatoes and artichokes on a thin crust. Aside from religion and politics, one of the few subjects that triggers fierce debate is pizza. As a $32 billion industry and a major part of the American diet, it's not a frivolous subject. But the definition of a perfect pizza depends on whom you're talking to. 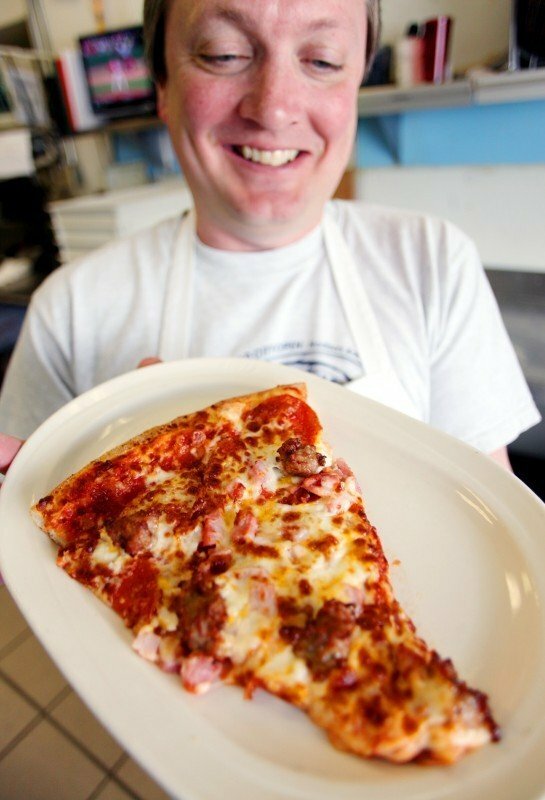 "Asking people how they like their pizza is like asking them what they want in a man or a woman; what their preferences are in a mate," said Brewer Stouffer, co-owner of the three popular Roman Candle pizzerias and a keen observer of the pizza wars. Battle lines are clearly drawn. It's those who love thin, crisp crusts versus those who crave cushiony crusts that are the consistency of bread pudding. Fans of heavy toppings can't fathom why others prefer crusts topped only with a few exquisite morsels. Other combatants regard "weird" toppings such as arugula and pineapple with derision, and stick with the classics like pepperoni and sausage. One only need refer to the menus at two of the Madison area's most popular pizza joints to get a sense of the difference. In one corner, weighing in at five pounds, is Glass Nickel's top-selling "Cardiac Arrest," a 16-inch beast holding a pound of cheese and what seems like half-a-hog's worth of meat (pepperoni, crumbled bacon, Boar's Head ham and sausage). In the other side of the ring is a Roman Candle's svelte but powerful contender, the best-selling Pestoral, a Kermit the Frog-colored pizza with pesto, roasted red peppers, kalamata olives, feta, tomatoes and artichokes on a thin crust. No pizzeria in Madison has fanned the flames of this debate as much as Cafe Porta Alba with its wood-fired oven. Owner Vincenzo Pugliese, a native of Naples, Italy, makes classical Neapolitan pizza, and has the certification to prove it. Seating is tight in his restaurant at Hilldale Shopping Center, so it's easy to eavesdrop on the arguments, which tend to sound like this: "I hate this. There's hardly any topping" on one side; "I love this. The crust is great and there aren't goopy toppings" on the other. Pugliese urges Americans to approach Neapolitan pizza with an open mind, and without Pizza Pit prejudices. He explains that his kind of crust, made from expensive, slow-milled flour imported from Italy and baked for 90 seconds, is supposed to be "crispy crunchy outside and soft inside, so you can fold it without it cracking - like a book." He's had customers become irate because their pizza held only three sprigs of fresh basil. "Basil is for aroma," he said. "I wasn't making a basil sandwich." Others demand more buffalo mozzarella, or complain that their pizza is "wet" (buffalo mozzarella sits in water, so it adds moisture). And some diners don't like the slight charring of the crust that inevitably accompanies time spent in a 900-degree oven. "Neapolitan pizza is well-accepted by about 80 percent of the people who try it, and the other 20 percent may not come back." Still, Pugliese insists he won't ever vary the type of pizza he makes. Pizza Brutta on Monroe Street, which opened in 2007, also serves Neapolitan pizza from a wood-fired oven, and offers toppings like sopressata, proscuitto, eggplant and fontina cheese. Over at Glass Nickel, which has seven locations in Wisconsin, co-founder Brian Glassel said his customers are also shying away from thick crust, deep-dish or Chicago-style crusts. About 10 people ask for thin crust for every call for thick crust, he said. "People say they don't want the extra carbs. Thin is in." He's unwavering, though, in the belief that, unlike a Neapolitan pizza, a Glass Nickel pizza must have loads of toppings. "We don't want a reputation for skimping on toppings," he said. Roman Candle's Stouffer has a different theory. "There should be a carefully measured balance between the crust, the sauce and the toppings," Stouffer said. "We don't believe in just dumping a bunch of medium-grade cheese on a crust; you have to put thought into it." One popular, but unorthodox, pie is Roman Candle's Algo-Malo pizza with beets, arugula, Alfredo cream sauce, walnuts, blue cheese and caramelized onions. At Ian's pizzeria, which has two Madison locations, plus one each in Chicago and Milwaukee, the Mac n' Cheese is by far the most popular pizza; it can be ordered with thin or thick crusts and by the pie or slice. Ryan Flohr, a supervisor at Ian's on Frances Street, said another unusual pizza - with barbecued chicken, bacon, Cheddar cheese and ranch - is also a top seller. But despite the growing interest in inventive toppings, universally, the basic pepperoni pizza, often with sausage, remains the eternal best-seller. "In difficult economic times, people are attracted to things they know and feel comfortable with, " Stouffer said. "Luxury is frowned up by a lot of people, so there aren't a lot of new fusion, fine dining restaurants opening anymore. "I think we will continue to see a lot of pizza places open, though I don't know if they'll be around in five years. 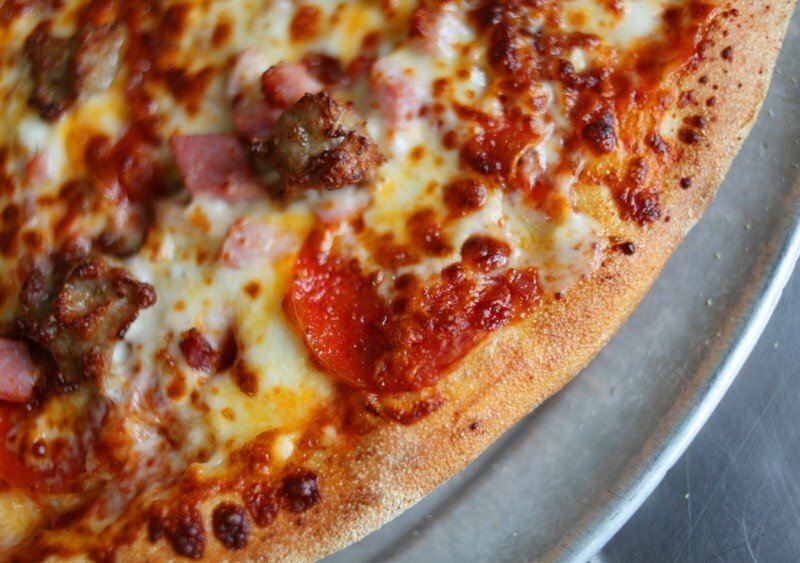 Pizza is the universal comfort food all over the world." But as for the question of what type of pizza is the best, Stouffer said, "that will never be settled." How pizza became a Madison staple.